I did a rework this week of an old photo...you know how that goes, right? You progress in your photography and your post-processing skills, and you think: "hey, remember that photo I captured at ______ last ______? (fill in the blanks) Let's see what it looks like now." In this case it wasn't so much a new processing skill I learned, but that I realised after browsing through the particular shoot's thumbnails that I realised I had taken alternative compositions of this scene. With the advent of digital imaging we tend to sometimes just click the shutter as many times as we can at as many perspectives possible to make sure we make the most of the scene...the problem is we end up forgetting exactly what we shot and why we did so. The original is of a lonely tree (cliche, right?) 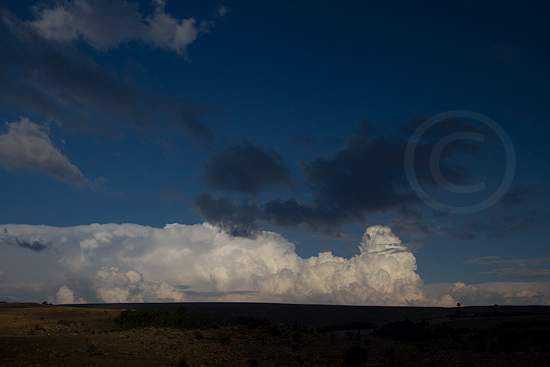 overwhelmed by some building cumulus clouds over the South African Highveld. I titled the photo - you guessed it - OVERWHELMING. The original perspective was shot using the Canon 100-400mm zoom lens, at a focal length of 105mm (thus nearly as wide as I could go with this lens). Just for overall perspective, here is the same scene (albeit with a cooler white balance setting) shot at 22mm. This is close to how the human eye perceives the scene (at 35mm focal length equivalent). Now, going back to the folder I remembered that I had also used the 105mm focal length setting in the first post on this scene and shot a few consecutive frames with the view of stitching them together as a panorama one day. That day came last week. I opened up the 3 consecutive shots in Photoshop in order to stitch them together using the "Photomerge" command. Now it goes without mention that the final stitched image not only provides a "grander sweep" of the scene, but also has a much higher resolution than I could have achieved with a single image...this makes it easy to print it BIG. I also went for a darker, moodier feel...converting to black and white with a red filter to bring the most out of the blue sky (that tip is for free!). The only crop I applied was to remove the "white edges"...after compiling a panorama the image is usually left with some white edges where the image had to be straightened to fit the next image perfectly. I don't have a larger version than the 500px version online yet...so watch this space. I would love your feedback. Which one works better for you, and why??? From the top i would place your 3 captures to my liking.My first choice would be number 3 then number one and last number 2. It is such a bonus to discover images that you had overlooked before. Powerful imagery. Nice! Great picture showing the overwhelming power of nature. I call this trend accidental panoramas. I noticed it whilst trying to capture a Prague city scape, I shot many different frames, but none seemed to capture the composition I wanted. 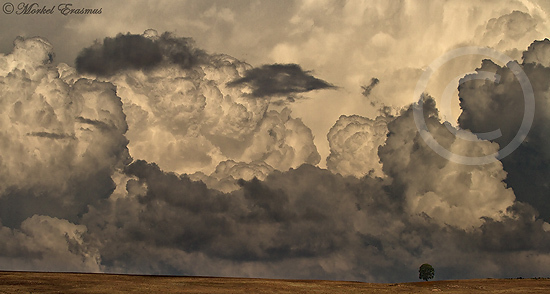 Using the accidental panaromic technique, I merged all my frames for a gigantic panaramic image and cropped to get the composition I wanted. Very keen now to revisit old scenes. Thanks very much for taking the time to visit the blog and for your comments Mike, Christo and Jon.